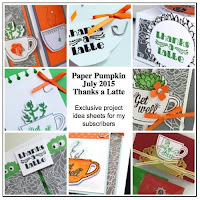 I wanted to share with you today something that I do for my customers that subscribe to My Paper Pumpkin through me. First off I guess I should explain what MPP is! 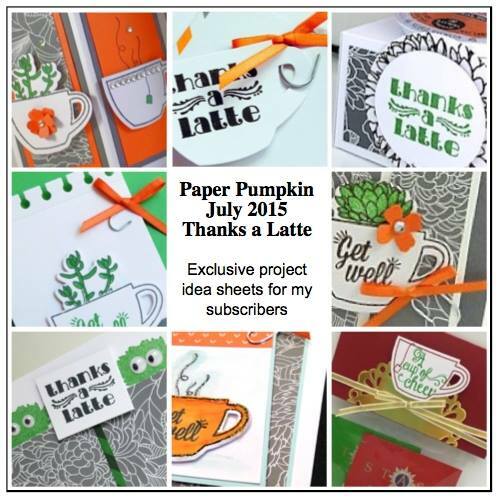 It's a monthly subscription service that ships direct to your door once a month and includes a cute little 'surprise' stamping project intended for 30-60 minutes of fun and creativity! So it might be cards (quite frequently but not always), gift packaging or even a 3D decor type item (once in awhile). Part of the fun is that it's like getting a stamping grab bag in the mail! It contains pretty much everything you need to complete it! color pictures of the designed projects along with instructions. 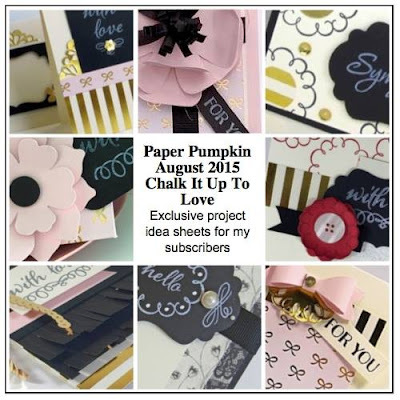 A clear block is included along with your 1st months shipment to use with your stamps. Just add your own scissors and regular adhesive. I have teamed up with several other demonstrator friends and we each design a project and write out step-by-step instructions (including measurements if needed!) and then it's complied into a multi-page, multi-project (8-10+) PDF and personally emailed out to our own subscribers as an exclusive bonus! 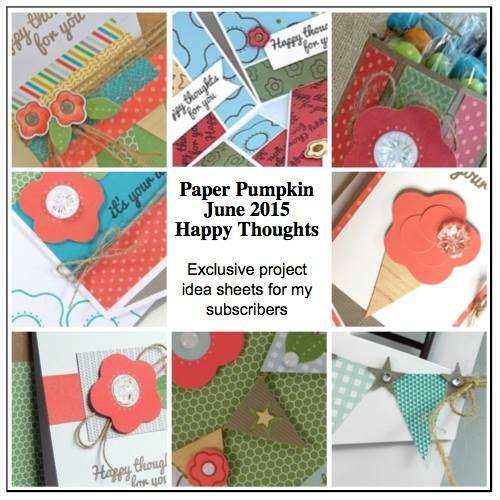 We do ask that the file not be shared and our ideas are not blogged either, so yes it's truly something extra to help you see lots of other ideas than what the kit originated as! Are you interested in getting started? Would you like to try it and save 50% off your 1st TWO months? Want to the fine print details? subscribers are able to take advantage of Past Kit availability and order extras of your favorites or ones that might have shipped before you joined! SU! has committed that ink spots (small ink pads) will not repeat the same colors within a 12 month period. CLICK HERE TO JOIN NOW HALFOFF code ends on Sep 10th! Thanks for stopping by and I'll be back later with one of my latest swap cards! So yes, we'll move along to the fun but hey, saving 50% is pretty fun too & getting bonus ideas for FREE, heck yeah!